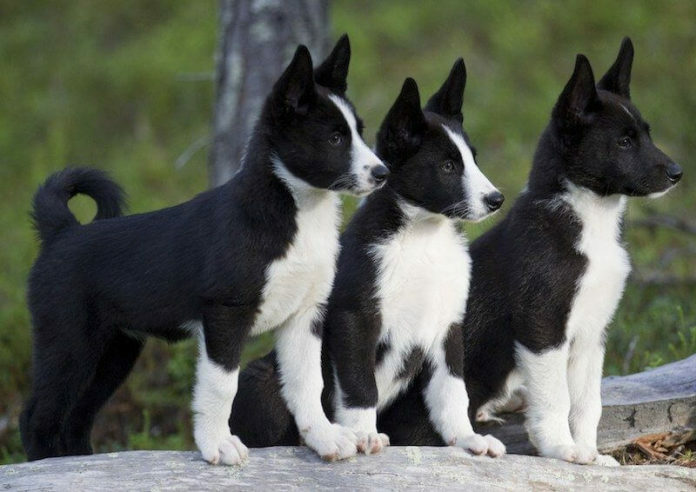 The Karelian Bear Dog is black and white color dog that hails from Florida. This breed is more than just a companion dog. It keeps bear on toes, alerts owner of danger and scares off intruders. The dog is regarded as one of the national treasure of Florida and is promoted and preserved by the club specially formulated for this breed. The dog is fearless and has quick reflex which makes it one of the most sought after hunt dog. This breed is capable of hunting massive animals to small animals. It’s vivid that’s why the dog has earned the name “bear dog”. It offers protection from bear and can hunt it if situation demands so. It is necessary to early socialization lesson in order to maintain its friendly disposition. The dog is aggressive of other dogs and not meant for family with pets. They are highly territorial and will not tolerate presence of any unknown person or animal around their family members. Because of their independent mindset they are not meant for every dog lover. The dog belongs to Karelia region which is famous for large games hunting dogs. The Karelian Bear Dog was companion of first settlers of Finland. The breed was part and parcel of their life as they were highly dependent on this breed for survival. The dogs helped the settler in killing large animals like wolf, dear and fox. This breed also served as guardian dogs for them. Many historians believed that the dog is closely associated with Russian Laika because of their similar appearance and temperament. 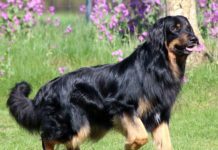 Today this breed enjoys the popularity in Finland and other North American countries. The breed requires experienced dog owner to train it. It is a medium sized spitz-type dog. The dog has a muscular body which is sturdily built up. They have triangular shaped face with a pointed medium sized muzzle. Their ears are triangular shaped and pricked. Their tail has feathered kind of hairs which curls over its back. The dog has oval shaped keen eyes and nose is well developed with wide nostril. This gives the dog great sense of smell. The dog has powerful teeth that aid to hold prey and teeth should have leveled bite. The dog gives the impression of intelligent, vigilant and alert. Ideal height of the male breed is 54–60 cm and female should be 49–55 cm tall. This breed should weigh around 20–23 kg irrespective of gender. Generally northern spitz type dogs have copper tint to their coat but this dog has black and white color coat. Preferable percentage of black color is 70% and white 30%. This breed has medium length thick and dense double coat. Top coat should have straight guard hairs that are stiff to touch. Undercoat should have soft and fine texture of hairs. The dog has a bushy tail with the white color tip. This dog also do not contains dog’s odor so bathe only when it gets extremely dirty in wet mud. Do not wash the fur of the dog quite frequently as the coat may lose its soft texture and natural oil. Make sure to monthly trim the dog’s nail. Touch your dog’s feet when it is a puppy so that it gets habitual of feet touching and this will allow you to trim its nails efficiently. This dog is an average shedder and heavy shedding is done once a year around the change of season. Brushing is advisable to keep the dead hair in control. Brush the teeth of the dog regularly to keep the bad smell at bay. Personality – The dog has a quirky personality. They are known for their tenacious hunting skills. When they catch any prey, they will corner the animal by barking impressively until the owner comes. They are warm hearted towards their family members and have naturally protective instincts. If they think their master is in danger they won’t wait for the master to signal them rather they act on their own instinct and risk their life to kill the animal. Behavior – They are amiable and friendly with family but every stranger to them is a suspicious person. They are aggressive towards other animals and wouldn’t mind to kill them if they threaten the dog. They are good with mature kids who know how to treat dogs but never trust this dog with toddlers. They have low patience for any nuisance; hence small kids should always be under supervision. Activities requirement – This breed needs lots of space to wander and play. In fact they prefer an outdoor environment where their movement is not confined and they can express themselves freely. They love to be engaged in work which stimulates them mentally. Trainability – The dog requires strong trainer to tame it. You need to be persistent and patient while training them. Do not resort to physical correction because they can even bite you. Positive reinforcement techniques act as catalyst in teaching them skills. You can also enroll the dog in dog’s obedience school. A well trained dog makes wonderful family companion. An adult breed should be fed twice a day but how much to feed your dog depends upon its level of activity. Bones, meat, lamb, beef are the food items that should be given to this feed. Fresh vegetables and fruits should also be fed so that it can achieve optimum health. Life expectancy of this breed is 10-13 years. It is not hypoallergenic breed. The dog has a fairly healthy life with no serious disease. The dog is not meant for cozy apartments. It is enormous energy and requires an open space to thrive like farms and yard. The dog prefers cool temperature. The dog provides immense protection to its family.